Macon Candy: See You on the Sweet Side: Good Golly Miss Molly! Celebrate the birthday of one of Macon's most legendary musicians at this weekend's Fly South Festival. 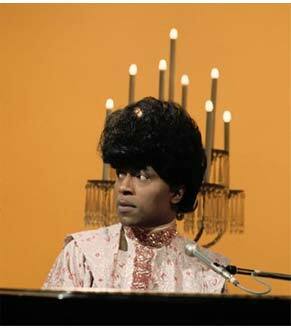 Little Richard Penniman turns 77 on December 5! In honor of the "Architect of Rock n' Roll" and native son, the Georgia Music Hall of Fame and Macon Convention and Visitors Bureau will have a birthday cake in his honor at their tent in the Fly South BBQ lot. There will also be a get-well card for festival-goers to sign that will be sent to Penniman, who is recovering from recent surgery. Also at the tent, Little Richard: the Birth of Rock n' Roll author David Kirby will be on hand signing the newly released biography from noon until 2 p.m. and 6 to 8 p.m. Finally, Fly South hosts a Little Richard Impersonator contest, starting at 1:30 p.m. We'll provide the props and music - all contestants have to do is their best rendition of their favorite Little Richard medley and have a chance at winning the $300 grand prize! Say it with us now: A-WHOP-BOP-A-LU-A-WHOP!